A decade ago Wendy Wells, co-founder of City Art Gallery, told me that jurors, gallerists, curators, and other professionals in the art world generally looked for continuity in an artist's work. 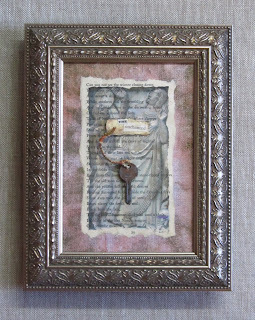 She cautioned me to submit related pieces when entering juried shows. She warned against showing too much variety because it tends to send the wrong signals when others are asked to evaluate one's seriousness, quality, and approach to making art. At the time, I'd been making art for less than a year ... but I took the advise to heart. Since then, I've heard this advise over and over again ... sometime phrased differently, often for other reasons, frequently on Internet forums discussing the creative process. 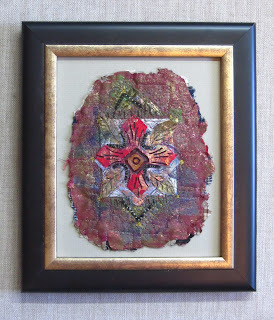 By the time I found on-line art quilt groups, I was already quite accustomed to "working in a series". 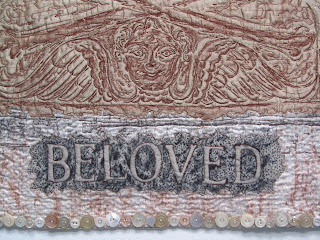 My Grave Rubbing Art Quilt series now numbers almost seventy individual works, and I continue to be inspired by the concept of cemetery words and motifs speaking through repurposed materials and plenty of stitching. 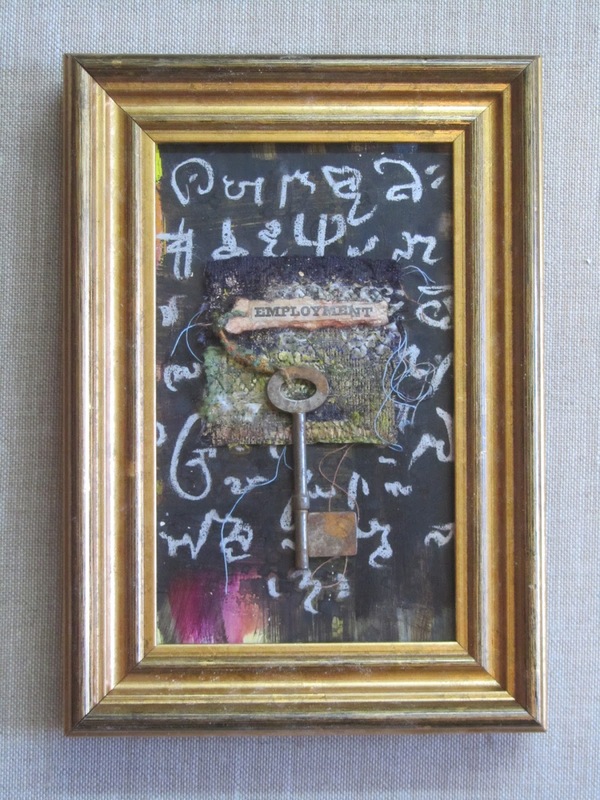 Every time I think, "I'm done with this series", I find another way to express the messages left on tombstone as the next piece. 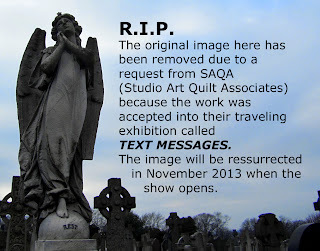 Recently, SAQA (Studio Art Quilt Associates) posted a call-for-entry for an upcoming traveling exhibition called Text Messages. Well, for me, epitaphs perfectly fit the bill. Yet, the rules for this show state that all works must measure exactly 24" in width and at least 24" in height. Until this month, none of my earlier pieces fell within these limitations. I generally don't make art in order to submit for any specific call-for entry. I wasn't going to enter ... BUT ... I couldn't get an idea out of my head. 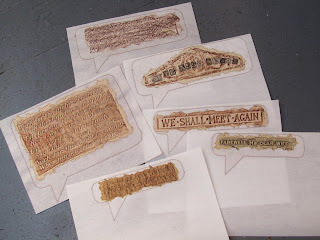 I just had to make Texting From the Grave, an envelop with individual "text messages" all created out of grave rubbings. So, I had ONE, and only one, piece to enter. Somehow this just didn't feel right. One piece doesn't convey the fact that I do work seriously in a series, explore my concepts in depth, and approach art making with continuity. Thus, I had to make another piece ... within the acceptable size requirement. Be Ye Also Ready, Beloved is it! 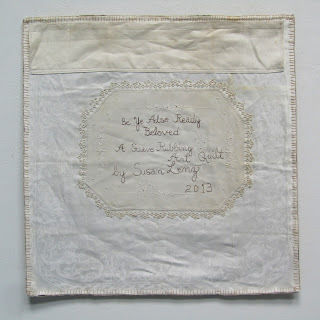 I took a large, 25" x 25" vintage, damask dinner napkin to Elmwood Cemetery. It is less than four blocks from my home. I know it well. I knew where to find a great tombstone for the black crayon rubbing. I did not capture the family name that is in the provided, curved space at the top. 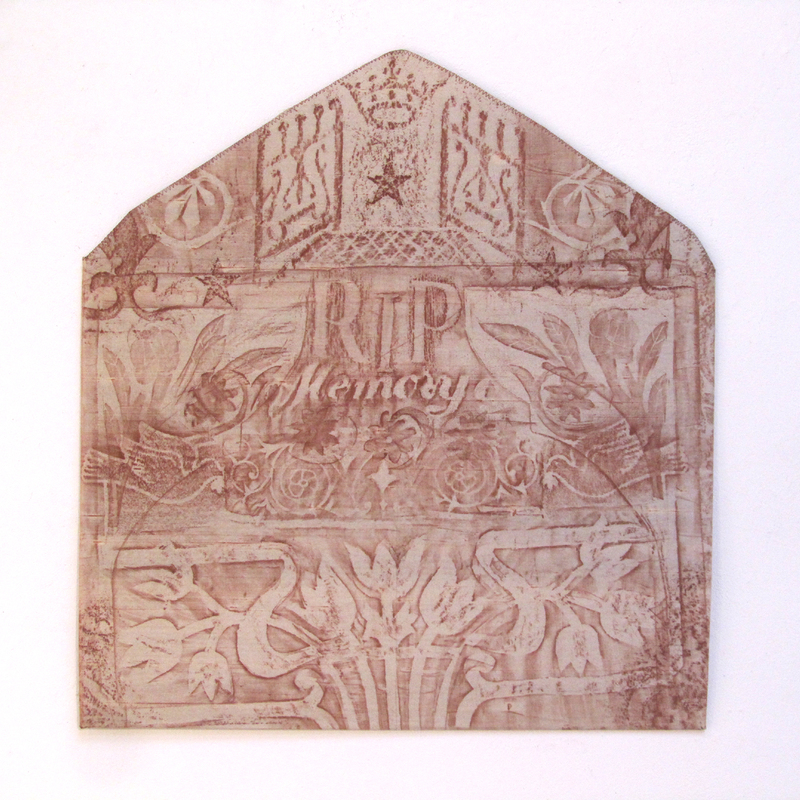 On this grave marker background I put a brown crayon rubbing from a late 18th century marker in Charleston's Circular Churchyard. It was one of my favorite's from the ancient place of resting ... a combination of cross bones, skull, and winged angel head. 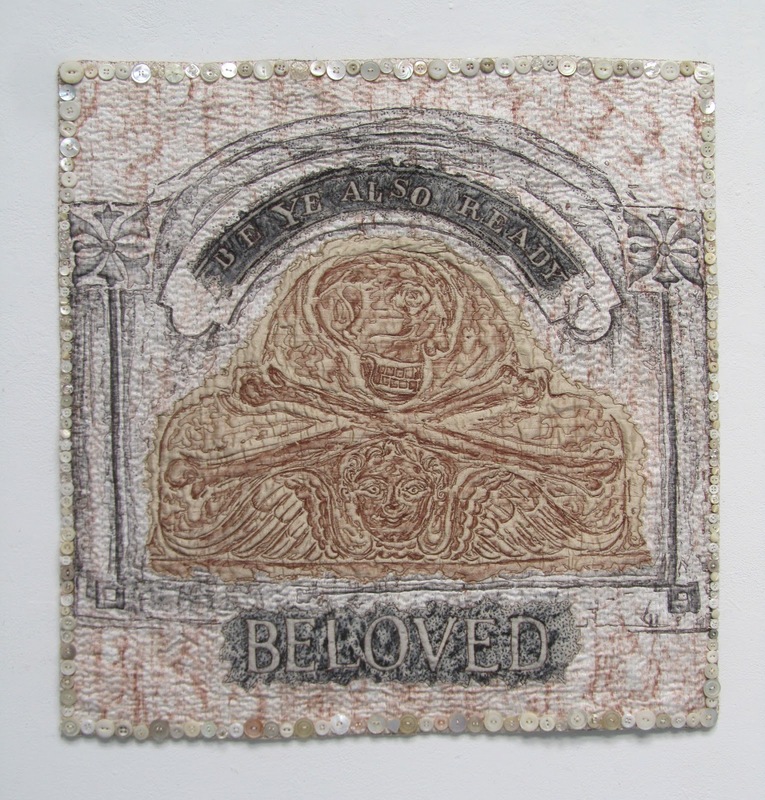 The single word "Beloved" was on a grayer piece of silk. It was made in Rock Ridge Cemetery in Washington, DC. I traced the outline of the curved, family name place onto an unused section of the grayer silk ... and returned to my local cemetery. I know exactly where to find perfect sized letters! The phrase "Be Ye Also Ready" was created, letter by letter, using only two grave markers from the mid-19th century. I've seen this four-word message on plenty of Victorian stones. 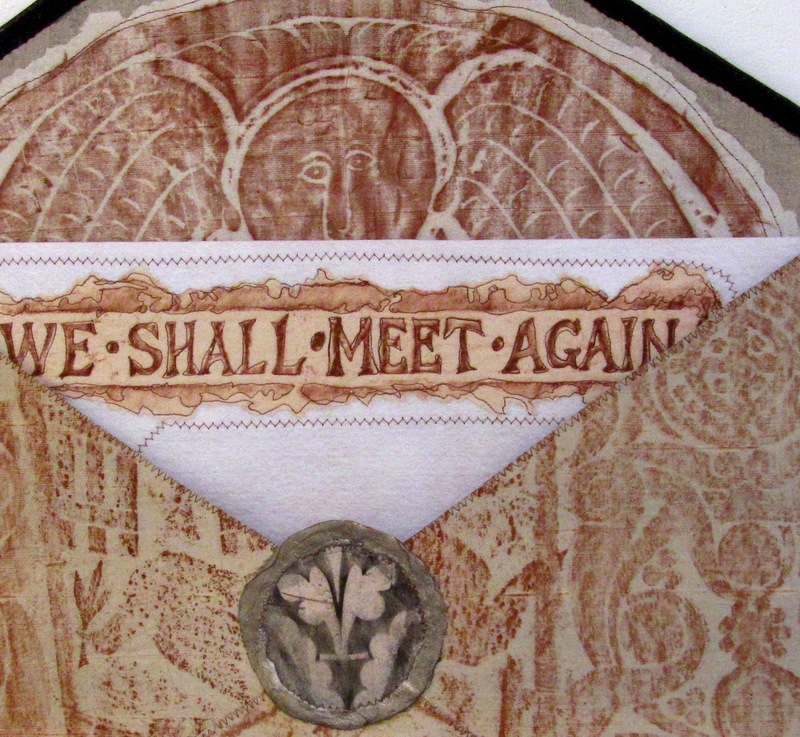 I've even made another art quilt using this phrase. (It is HERE.) To me, "Be Ye Also Ready" is the ultimate "text message" from the deceased past to the present living and to all the future. 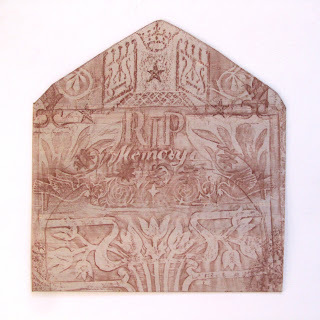 I added brown crayon marking on the remaining part of the damask napkin ... simple texture from another gravestone. 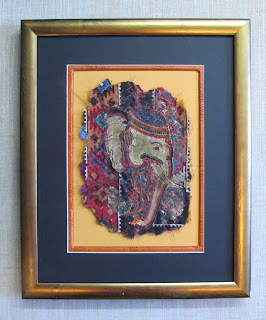 The grave rubbings are all free-motion stitched with King Tut #983 Cedar variegated thread. The "batting" is really just recycled, white acrylic felt. It used to be a protective covering for a kayak of canoe being shipped from a manufacturer to River Runner, a local outdoors store. 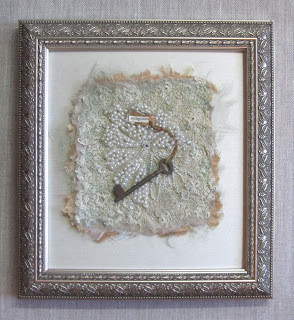 Various off-white threads were used for the dense, vertical running stitches. 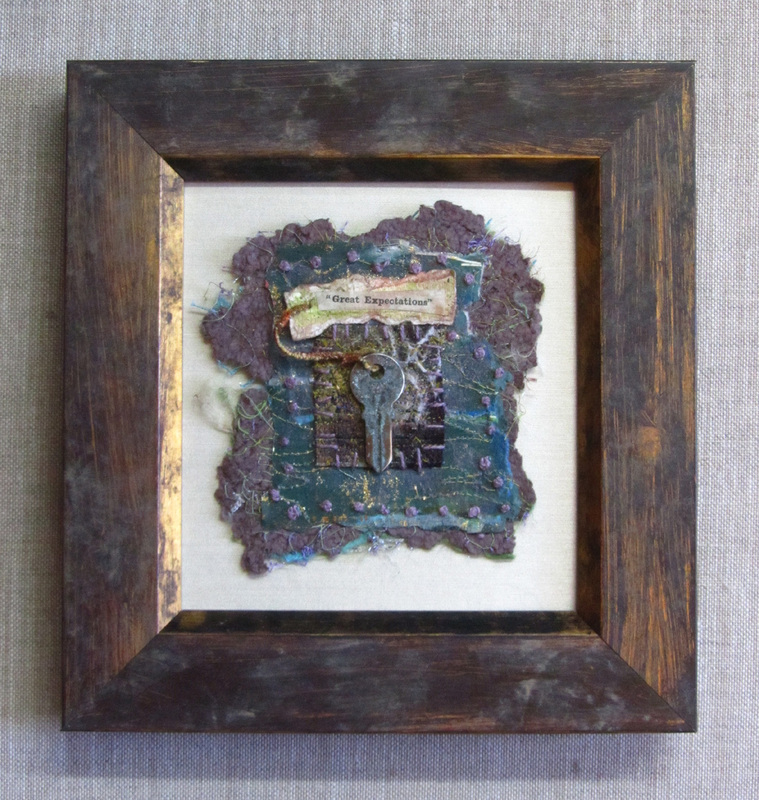 Two-strands of charcoal gray embroidery floss was used for the tiny seeding stitches. 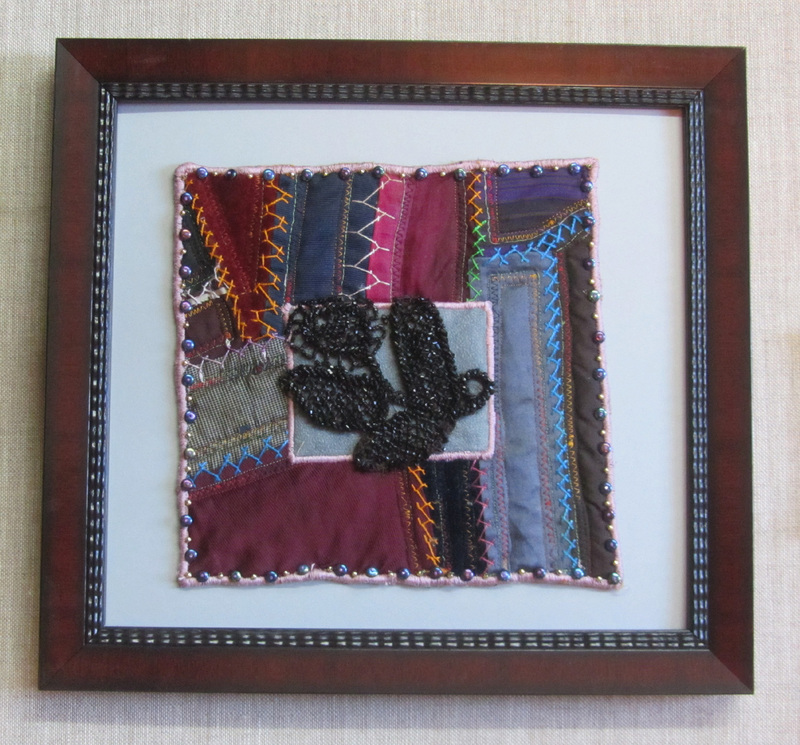 When all the stitching was complete, the piece only shrunk about a half an inch in width. I trimmed it to 24" and added the edge of vintage buttons. Another damask dinner napkin was then placed on the back, turned under, and button-hole stitched to the front. 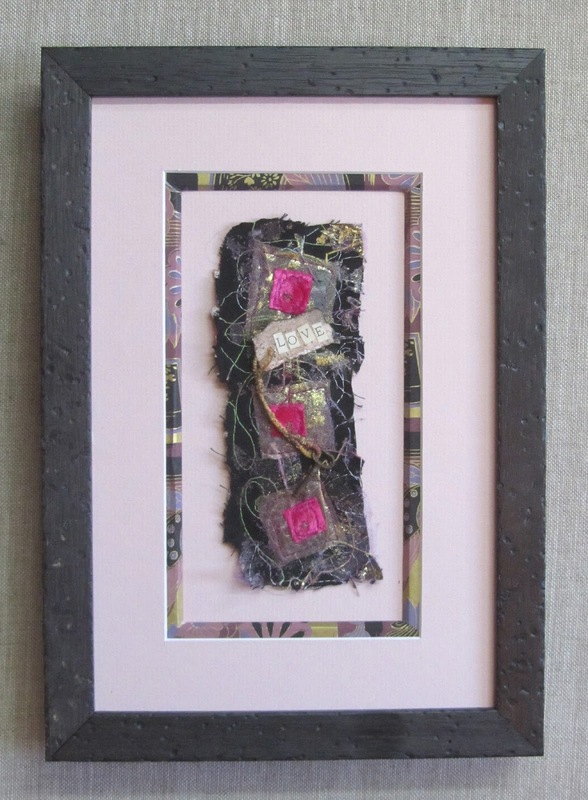 My "label" is slightly damaged doily with a pretty tatted edge. 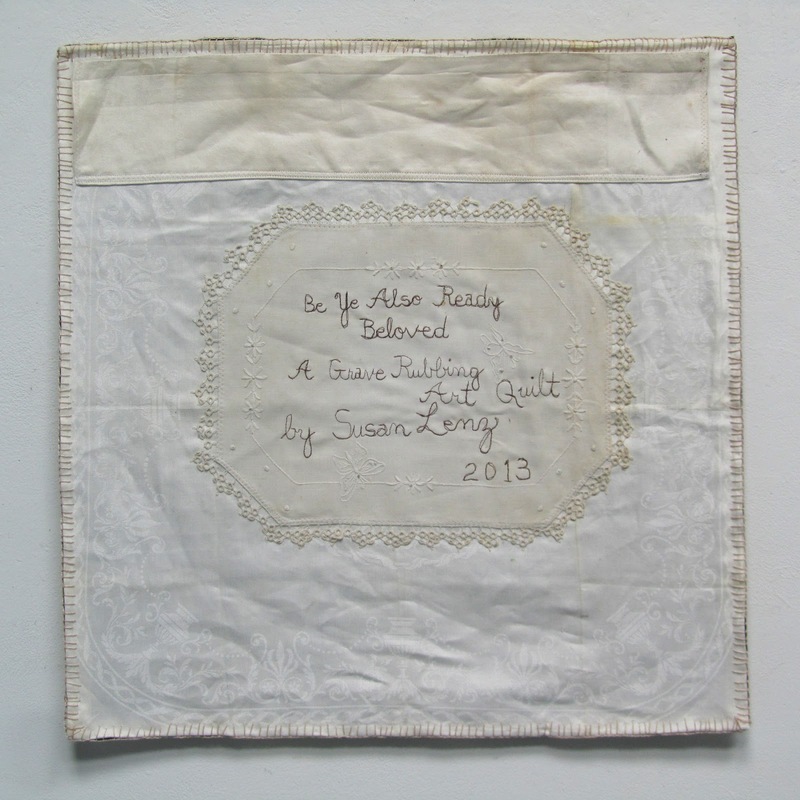 It was hand stitched to the reverse ... into the non-traditional batting. Yet another damask napkin was used for the hanging rod's sleeve. 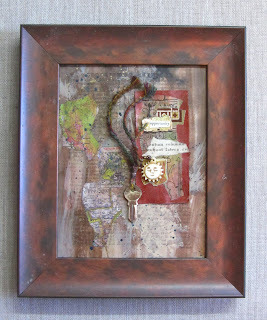 I'm ready to submit TWO pieces for the upcoming SAQA call-for-entry which opens on February the first! 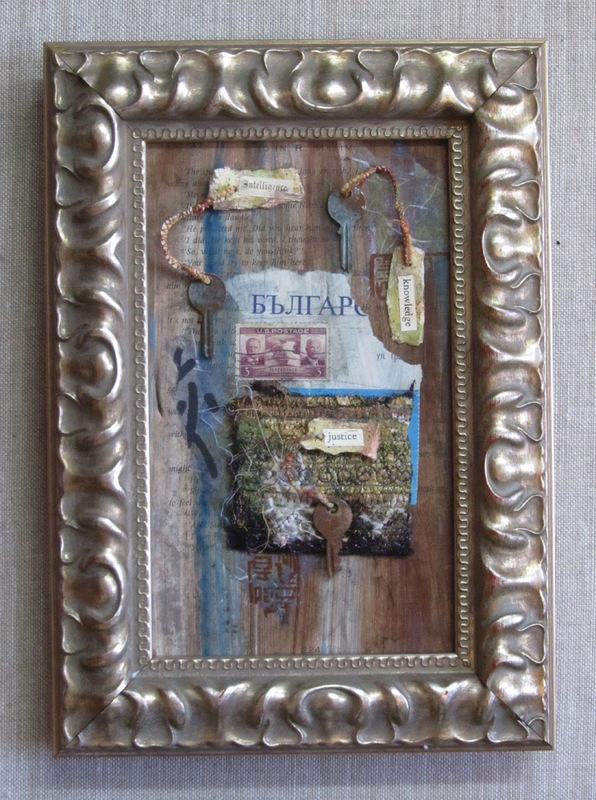 Earlier this month I replenished my stock of framed keys. I used a pile of little frames Steve had made from scraps of moulding here at Mouse House, our shop. It was fun. 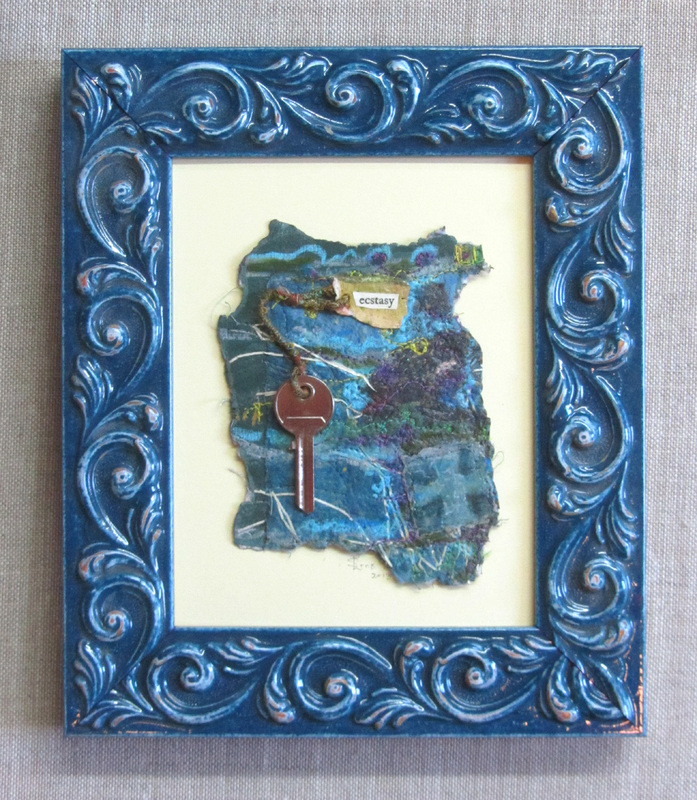 I made them in my studio using the tagged keys that were part of Wall of Keys ... approximately 1200 of them hanging together. 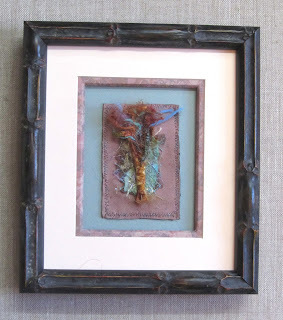 Unique backgrounds were made using my "embellisher", a dry felting machine. I was quite pleased. Steve even made a video. Well, Steve gathered up a large bucket full of scrap moulding. He intended to make a bunch more frames. Though I thought I was finished with this on-going project ... at least for a while ... I gave in. Friday and Saturday was spent making twenty-nine pieces! It was a design challenge. 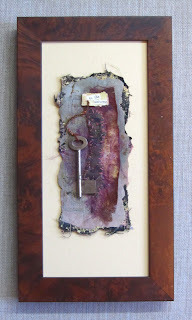 The scraps of moulding, the unframed keys hanging on our sculptural door units, needle and thread, and mat boards all came into play. I got into a routine: Design piece within the measurement limits of selected moulding; write the measurement on the back of the scraps of moulding for Steve to cut and build; pick mat board and stitch piece in place; create the label for the back of the piece; enter piece into inventory book. When Steve returned from the garage with frames, I put the piece, the label, and the frame together for him to assemble. I also took a photo at this time ... before glass was added to the package. Did this create a mess? You bet! But, it was very fun and obviously very productive! 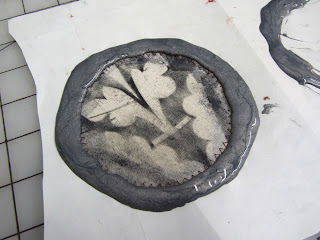 The work went quickly ... because I really wasn't doing much "art making". 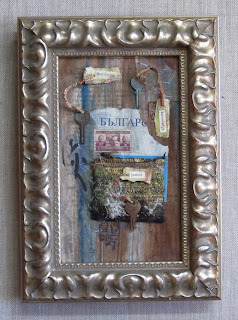 I was simply DESIGNING work using previous created bits and pieces from an earlier installation called The Archeology Project. The Archeology Project was one of my first installations. 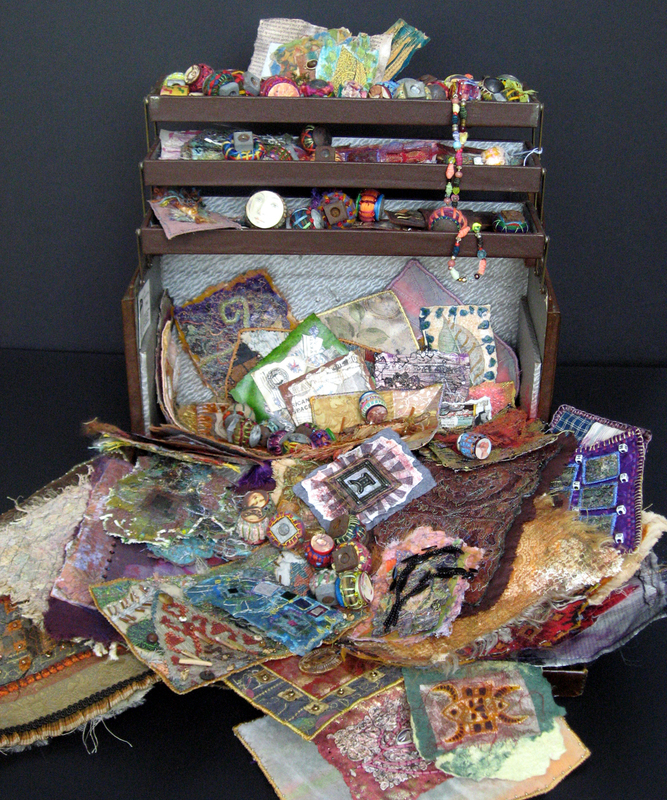 It was made to look as if a collection of unique, foreign relics stored in vintage suitcases. 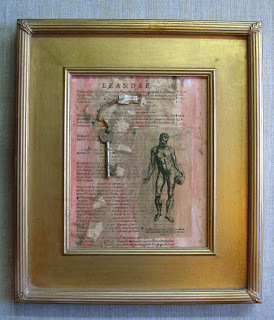 I wanted viewers to be able to shift through fragments of materials, small objects, pages of text, and secret treasures. 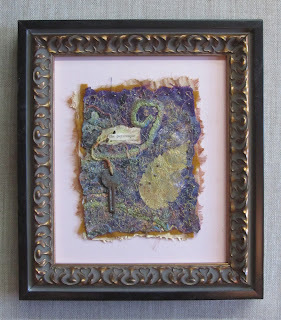 I wanted to recreate the fantasy of finding oneself in the face of discovery, as if at the next "King Tut's tomb" or given free reign in the storage units of a faraway museum. 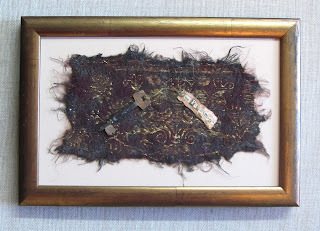 I imagined a narrative behind these artifacts. In my story, a quirky, distant uncle died and left to me his life's work ... an amassed treasure trove of ancient articles, each with a story of its own. To create The Archeology Project, I cut up every UFO (unfinished object) in my studio. 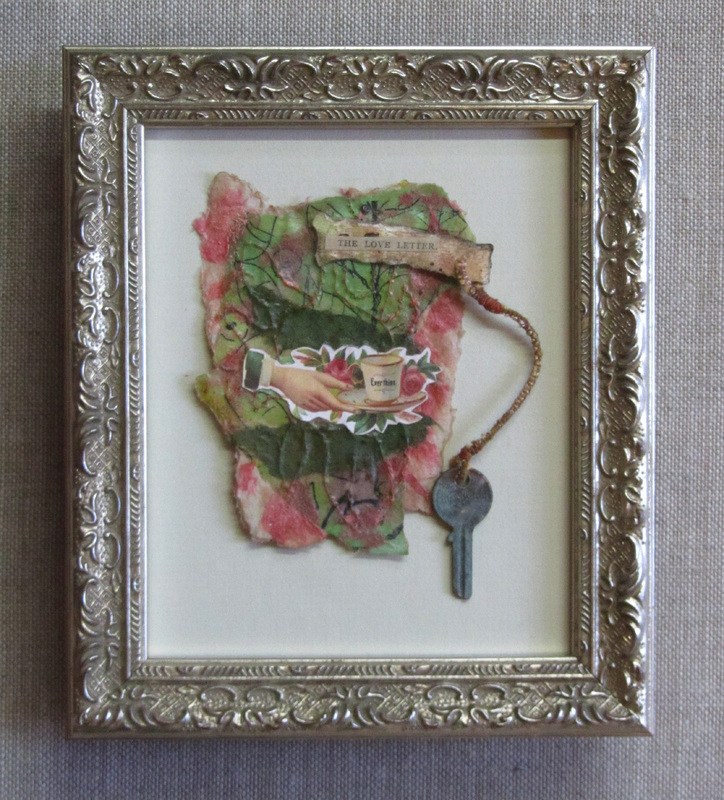 I collaged old ticket stubs from childhood travels with expired passport pages, stamps from my old hobby, and bits of antique book pages and maps. I invented a script that resembled all the shorthand I'd forgotten from high school. 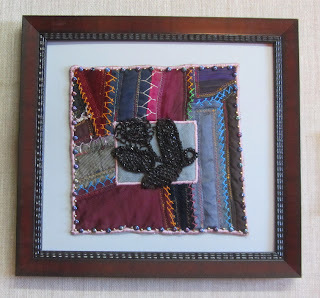 I stitched and beaded and made everything "two-sided" ... so that it could be handled, turned over, and inspected from every angle. 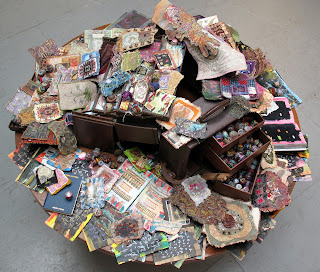 My first wrapped, wooden spools were made for this installation ... an obsession that I still have. A few keys were even used ... definitely still an obsession. The work was on view in a proper gallery. People were allowed to rummage through it all ... and everything was individually priced. Some things even sold. Later in 2007, I took one of the three suitcases and an assortment of the objects and staged the photo above. I called it The Collector and was overjoyed when it was accepted into the prestigious, international fine craft show: Craftform 2007. Steve and I went to the opening reception in the Wayne Art Center outside Philadelphia. I blogged about it HERE. 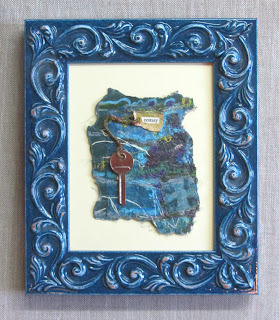 At the time, I didn't even know this location also hosted ArtQuilt Elements. I also didn't think I would ever really find my way into the art quilt world either ... even though I was stitching on a quilt, Bessie's Quilt, at the time. 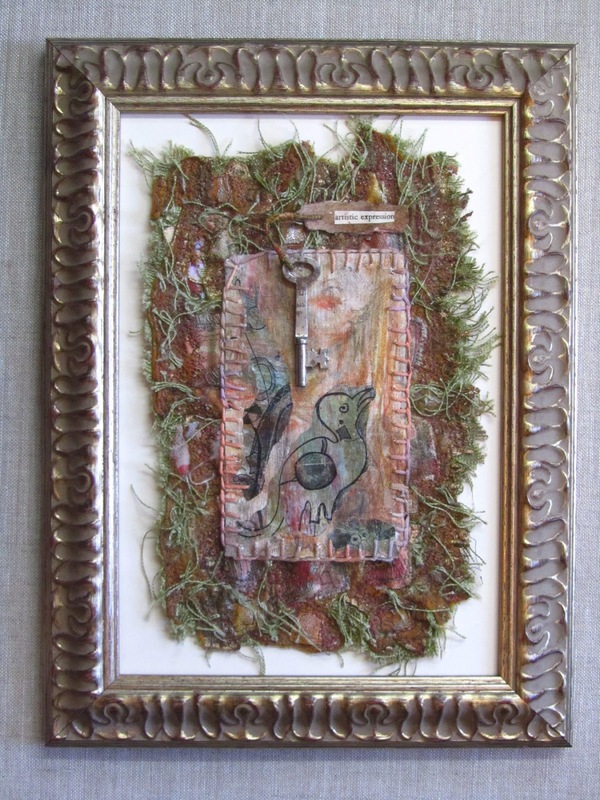 I simply "needed" this piece for Blues Chapel, another installation on which I was working. It is strange how one thing leads to another and back again. It is strange but, at the same time, familiar. 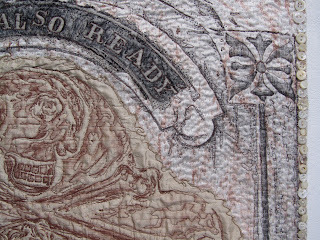 One of my first Grave Rubbing Art Quilts, Father and Mother, was accepted into ArtQuilt Elements in 2010. We went back to Wayne for this opening too ... and I blogged about it! Well ... I knew exactly where to find the contents of The Archeology Project. Though I've removed some of the parts and pieces (like the wooden spools and carriage bolts and all the artist books), the rest of the collection was still in its suitcases. 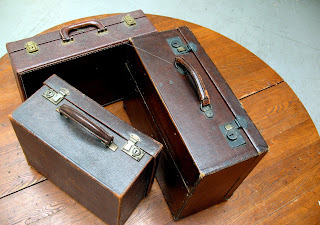 These vintage, leather bags were under a work table ... where they've been for a couple years. 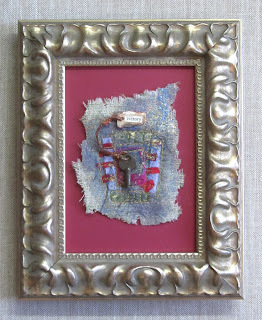 It was fun to open them and browse through the contents in search of a "fragment" on which to stitch a key. 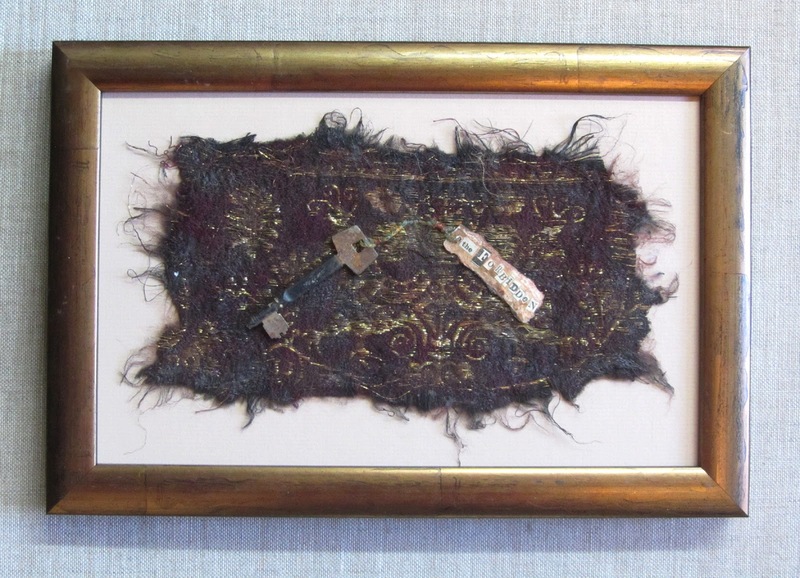 Some of the "fragments" and "relics" didn't even need a key. They just needed a frame! Some of the things inside the suitcases were simply layered together. 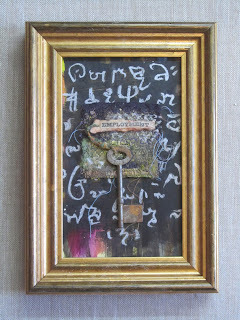 The Key to Artistic Expression was made by combining two pieces from the Archeology project, one on top of the other, with a key. Some of the pieces just needed an attractive presentation. Yet, with each tiny treasure came a decision: Which side to use? Sometimes, it was obvious ... like with Fragment LXVIII. The silk cocoon and fibers issuing from it made one side almost three dimensional. 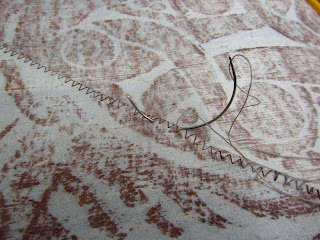 The stitching on the back was flat ... and now is hidden underneath. 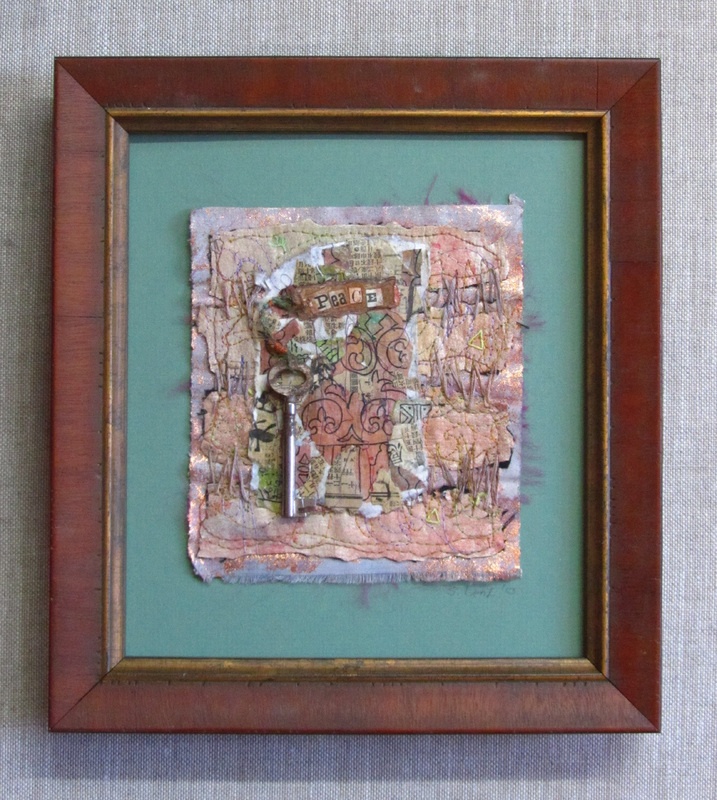 Some of the collaged pages came from an ancient book we once owned: TABLEAVX DV TEMPLE DES MVSES, Tirez Dv Cabinet De Fev Mr. Favereav. It was printed in 1655! (When we bought it, it was missing engravings, several pages, and the binding was more than a little "broken". We've never "cut" a fine book!) 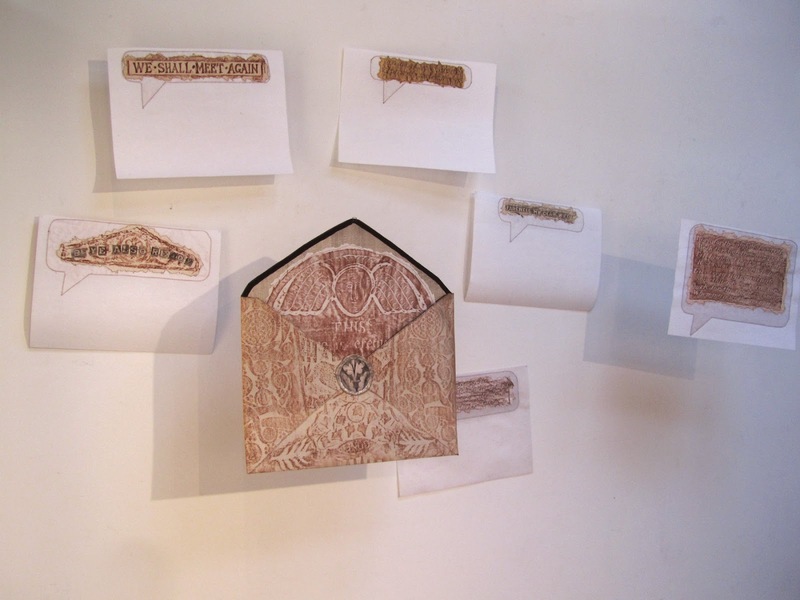 I'd forgotten that I had ever used any of these pages before making my "Muses Series" in 2011! 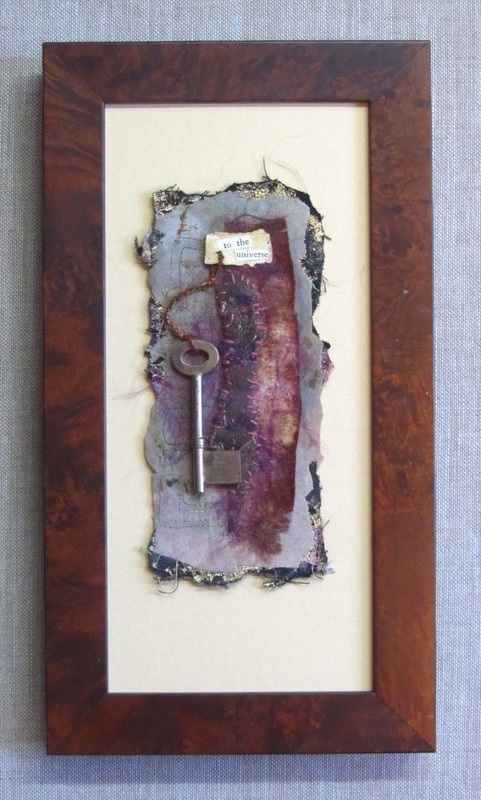 Of course, I had to select which side of the page to use ... and then I dry mounted it to acid-free foam-centered board and stitched "the key to history" on it. I had a lot of fun thinking about my older work and how so many of the same things still interest me ... always have. It was so easy to dip into my own past and design things for the future. I thought a lot about "finding one's voice". This is a topic that is often discussed on various on-line groups. The "art experts" in these Internet conversations encourage "newbies" to "work in a series" and "try different things in search of a personal style, unique characteristics, and 'one's voice' ". They caution less experienced "wannabe artists" that it takes time, often years, before "one's voice" is developed. I thought about all these words of wisdom while designing these "fragments" and "keys". I only started making work in 2001, seriously in 2003. 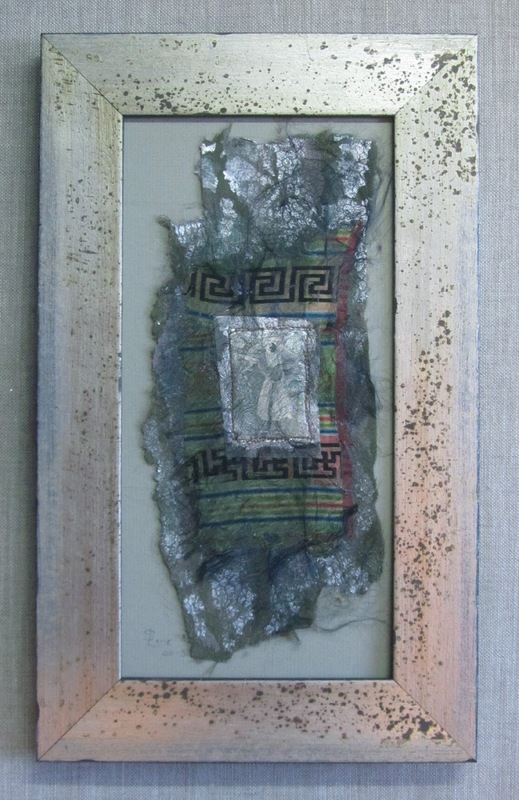 The Archeology Project was started in 2006 ... definitely toward the start of my adventure into the realm of a professional studio artist. (Please note, I don't have a formal art education. 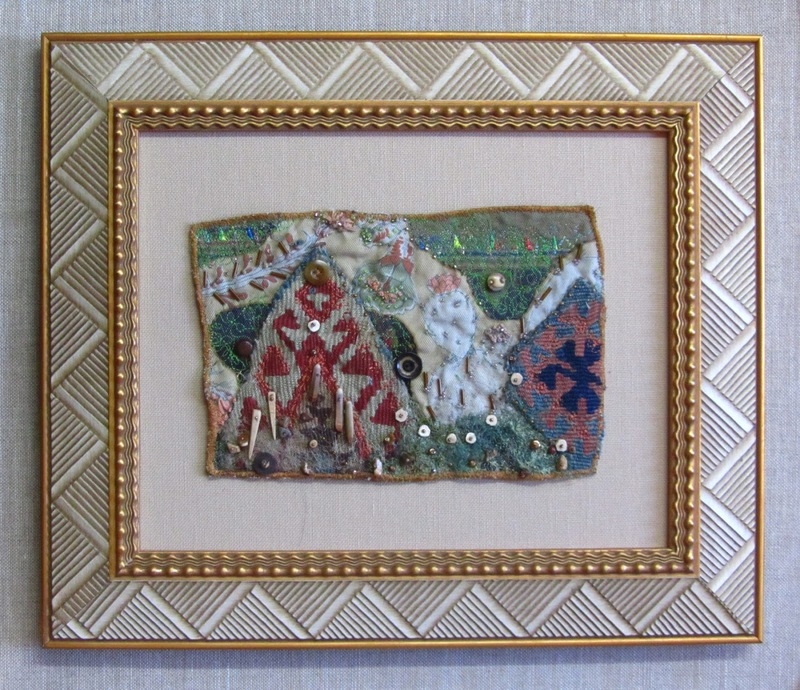 I started "making" art in 2001.) Did I have "a voice" then? Yes ... and it is the same voice I have now. In fact, I think "my voice" was with me long before I started making art. Although the advise found on Internet art groups is generally wise and well-meaning, there is another way of looking at the search for artistic individuality. Instead of spending months and years "developing" a voice, it is wise to simply LISTEN. 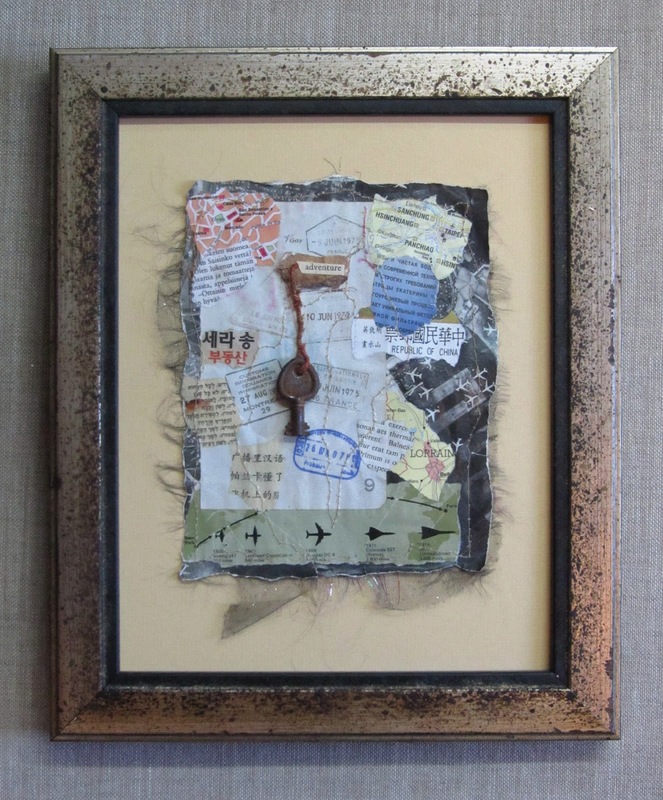 Content, message, style, and emotion are qualities of a mature artistic voice. The medium can change and/or develop. The techniques can change and/or develop. One will hopefully improve with practice. Some work will always be more successful than other work. 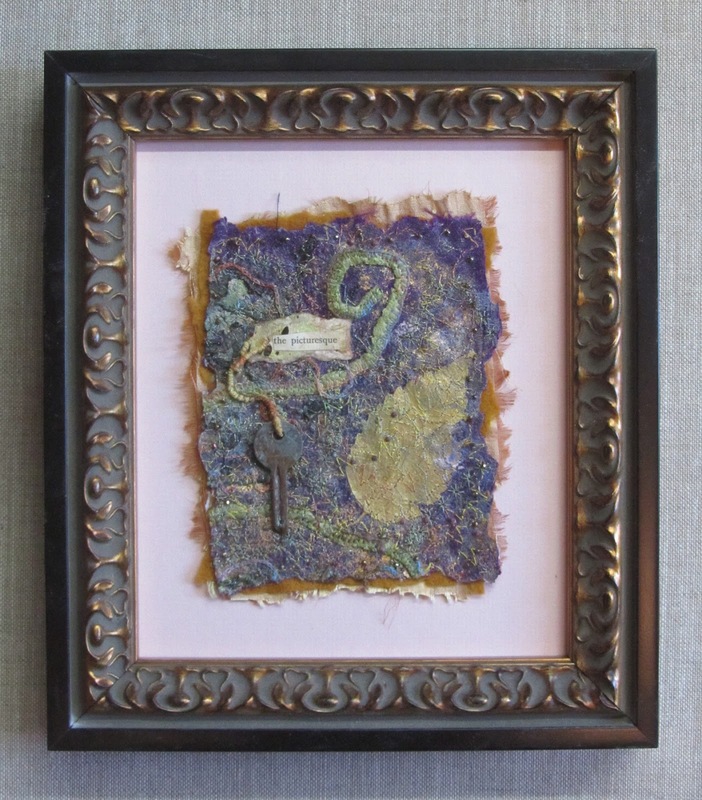 "Elements of art" and "principles of design" can be learned in a classroom or from a book. They will likely enhance one's quality ... but the most essential ingredients in an artistic voice are those that are already deeply rooted in the artist's soul. 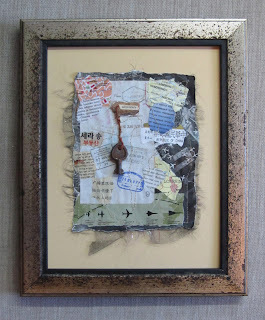 This is a voice trying to be heard, seeking for expression, and influencing everything in an artist's output. My "voice" was speaking long before I started listening. When I look back, the evidence is always in the works I made from the heart. The Archeology Project was from my heart and I'm happy to be resurrecting it as small, affordable pieces. Below are the rest of the little pieces I designed on Friday and Saturday. Steve and I had fun making them. 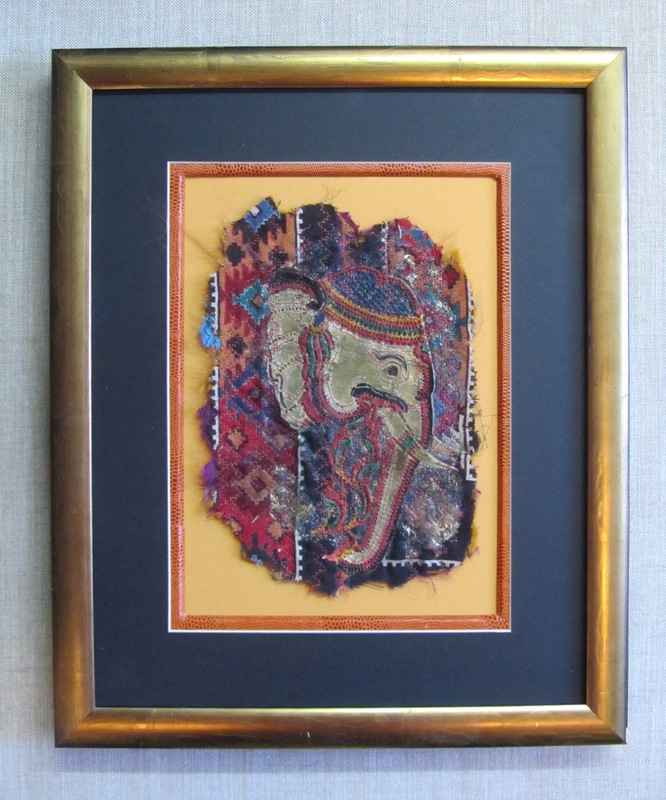 He had my frames built quickly and is actually still closing up the art in their specially selected mouldings. We also talked a lot of these works as "merchandise". Sure, they are for sale. 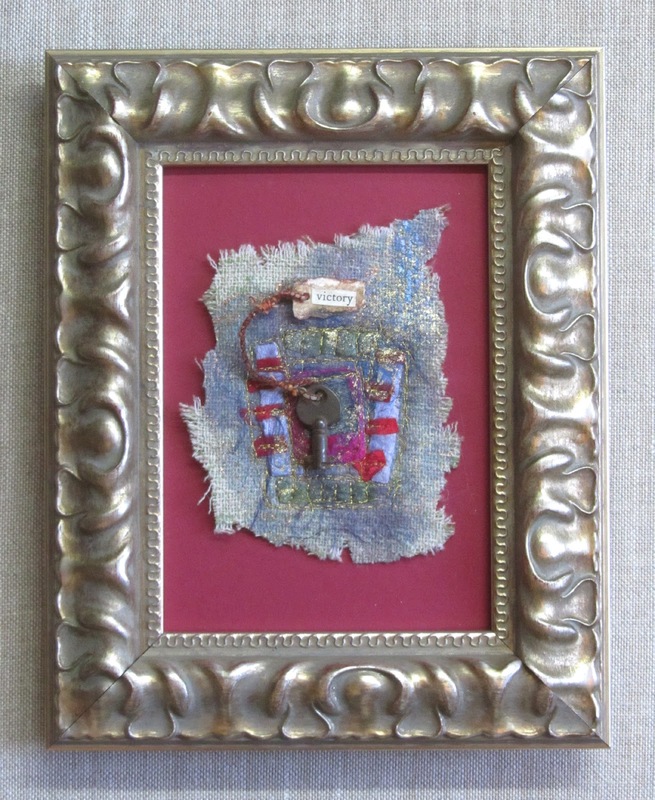 In fact, the entire reason for making the "keys" and "fragments" was because so many of the earlier framed pieces have sold during the last year-and-a-half. Steve wants me to make them available on-line. 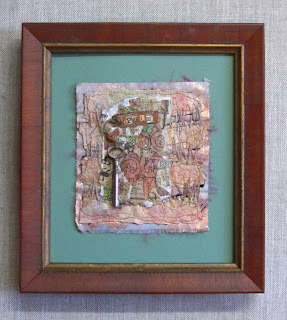 2) A way to document my work, my process, my thoughts at the time, and my "life in stitches"
I have rarely considered this blog for its marketing potential. 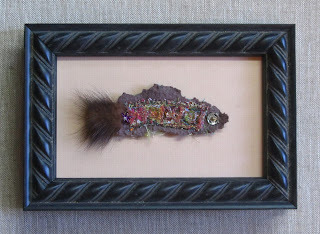 That isn't to say I've never sold a piece using my blog. I have ... a couple of times. Each time was a wonderful surprise. Still ... do I want to add prices? Do I want to turn some attention to "selling" via the Internet? I just don't know. Steve has set up a business Pay Pal account. It works. I could add "Pay Now" buttons ... but should I? 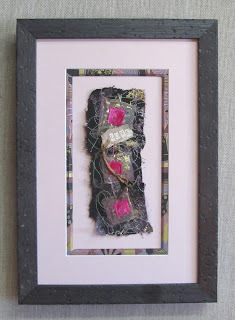 I've visited some of the on-line websites ... like Esty. It appears to be a "buyer's market", not a "seller's dream-come-true". I'm pretty sure I don't want to join this sort of opportunity. Yet, what if I started another blog ... just for selling? If anyone reading this blog post has managed to scroll down to this point, let me know your thoughts! All of these "fragments" and "keys" are priced between $60 - $100. Would you look at them on a blog on which sale prices were listed? Would you actually make such a purchase on-line? How do you feel about blogs that have an obvious focus on "selling"? I'd like to know! Below are the rest of the "fragments" and "keys". Enjoy! The photo below was added to several places in this blog post but has since been removed! LOL! 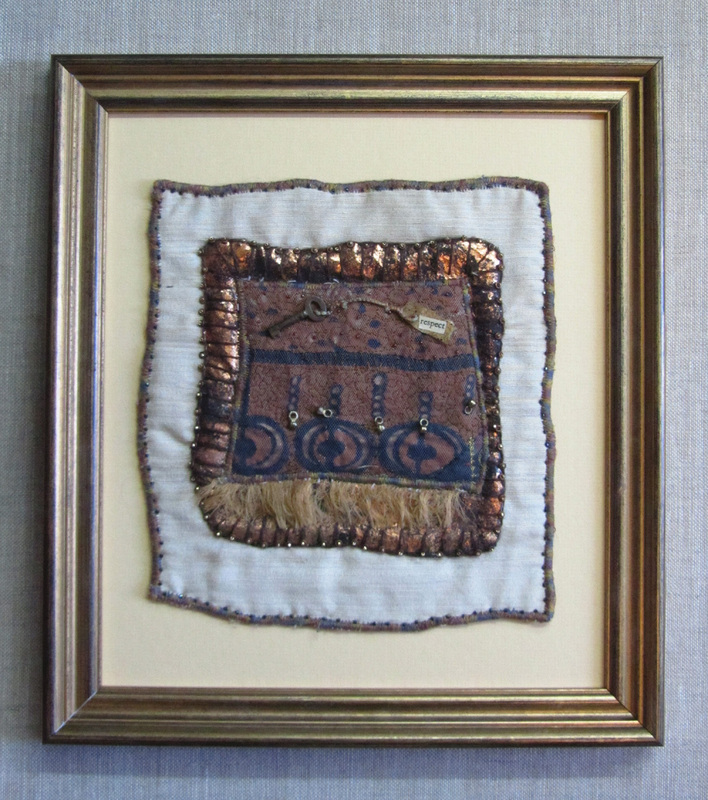 I AM PROUD TO ANNOUNCE THAT THIS PIECE HAS BEEN ACCEPTED INTO THE SAQA (STUDIOS ART QUILT ASSOCIATES) TRAVELING EXHIBITION, TEXT MESSAGES. 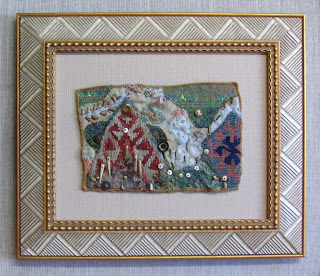 ONCE ACCEPTED, I RECEIVED AN EMAIL REQUESTING "full views" NOT TO BE SHOWN ON THE INTERNET UNTIL THE SHOW OPENS NEXT NOVEMBER AT THE INTERNATIONAL QUILT FESTIVAL IN HOUSTON, TX. THUS, THE BLOG POST HAS BEEN ALTERED UNTIL THIS TIME. DETAIL VIEWS ARE ALLOWED. 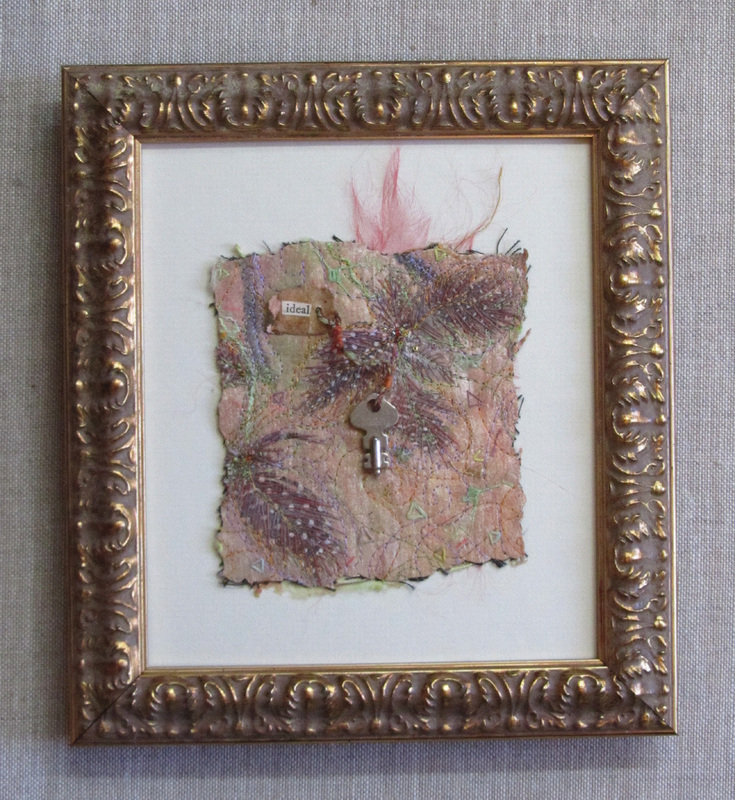 Last month I wrote about my submissions for the Metaphor on Aging SAQA (Studio Art Quilt Associates) call-for-entry. I wrote that I rarely ever make work specifically for a unique call-for-entry but I did for that opportunity. Well ... I've gone and done it again! This time I've made work for the upcoming Text Message SAQA call-for entry. I couldn't help myself. Once I had this idea, I had to make the work! The call-for-entry includes this description: In this exhibit, you have free rein to explore the many facets of what 'text messages' means to you--from the obvious connection to modern technology to works comprised solely of actual or implied writing. 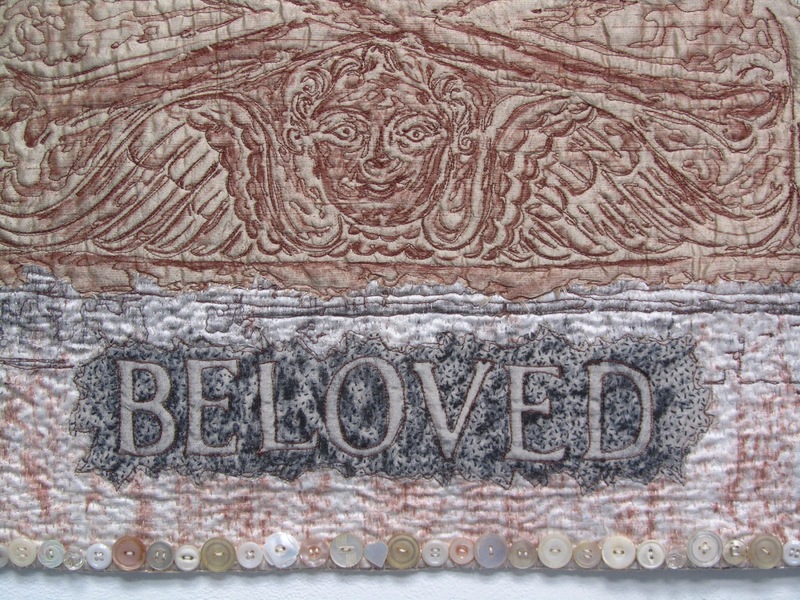 The unifying theme will be text on quilts, in any language, and each quilt must contain at least one visible letter or word. 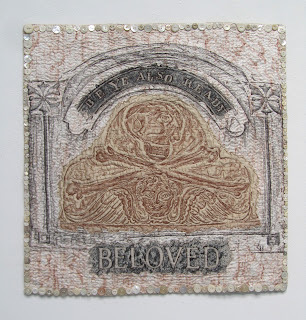 So, I thought I'd submit a couple grave rubbing art quilts until I closely read the rules for this call-for-entry. The width of each entry must be 24". The height must be at least 24". I've stitched over 60 pieces ... but none fit the size requirements. 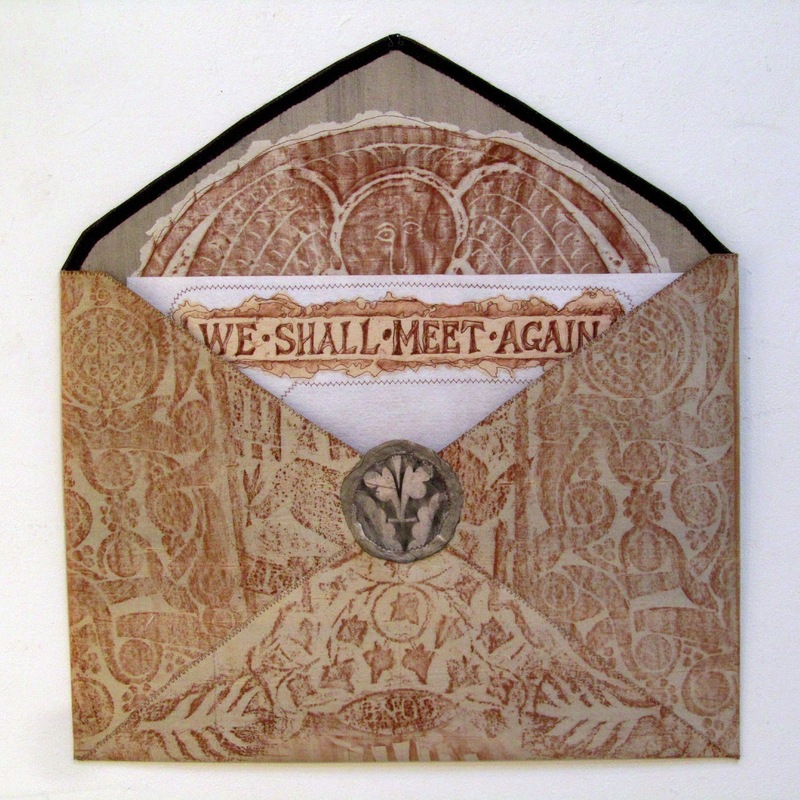 I tried to forget about this call-for-entry, but I just couldn't get past the challenge of creating a grave rubbing envelop with "text messages" to fit inside. 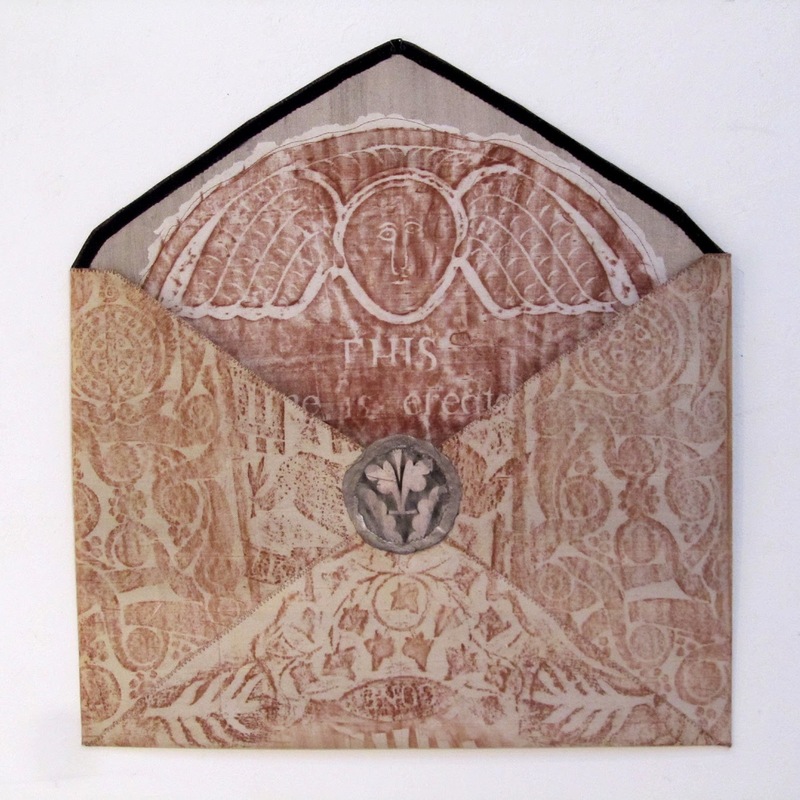 The first thing I did was to dissect an ordinary envelop and enlarge it to half the needed size. 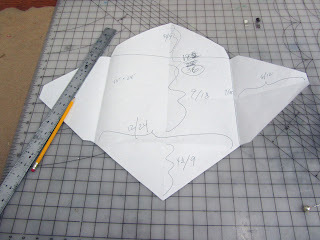 Then, I mapped out the full size of an outer perimeter on the back of some ecru colored silk. Off to the cemetery! The rubbings were carefully placed on the silk, ironed, and then the silk was dry mounted onto black Kraft paper using Fusion 4000 in my over-sized Seal press. 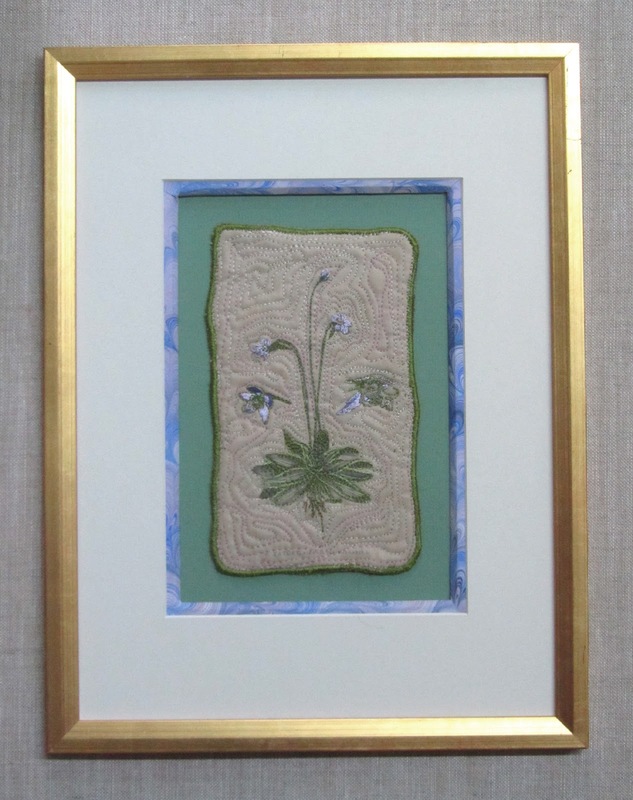 (It's good to own a custom picture frame shop!) The resulting fabric/paper folded perfectly. I zigzag stitched the edges. The width is exactly 24". Yet, this envelop didn't have the stability and strength I needed for my ideas. I needed "something" stiff. I needed mat board! 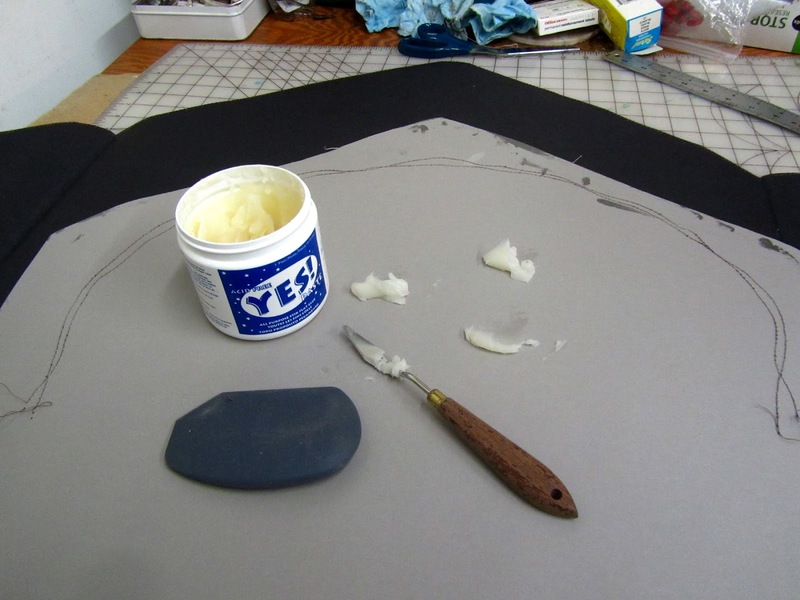 I traced a template and hand cut a piece of black-core, charcoal mat. 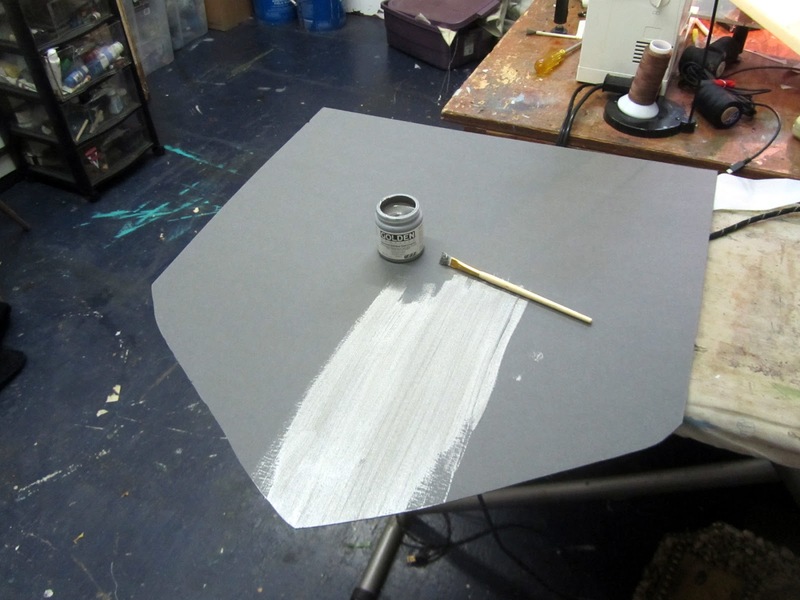 I wanted the mat board to resemble the fancy, metallic foils that often line expensive wedding envelops. 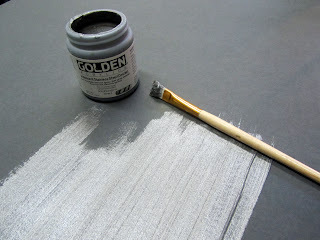 So, I painted the surface with Golden Acrylic's Iridescent Stainless Steel paint. It looked great! The paint has just the right reflective quality and still visually reads as a perfect neutral. Yet, there was "too much" of it. 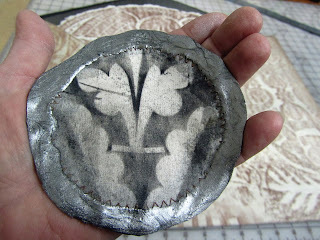 I dug around in my stash of grave rubbings and found a great 18th c. winged angel I'd made in Lyford, England. Perfect size. Perfect shape. Simply wonderful! WonderUnder (Bond-a-Web) was ironed on the reverse. 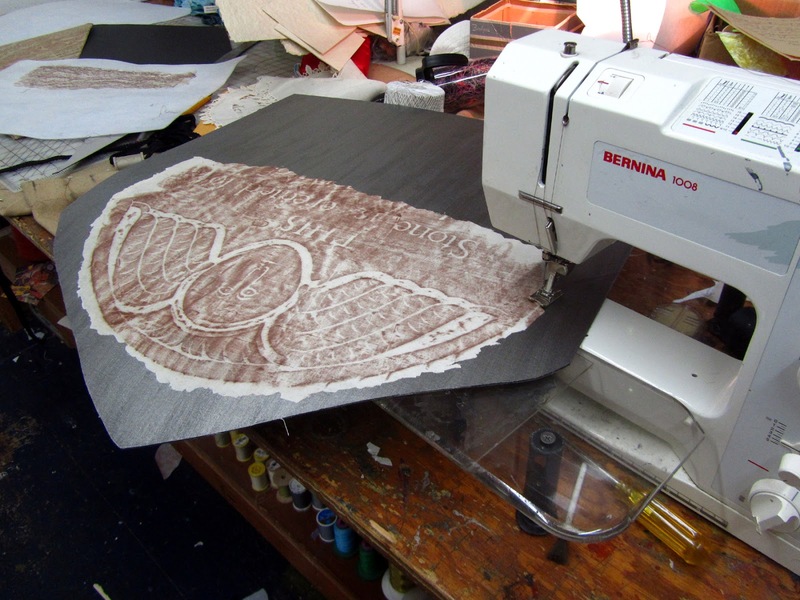 I "rough" cut the edges and ironed it in place. 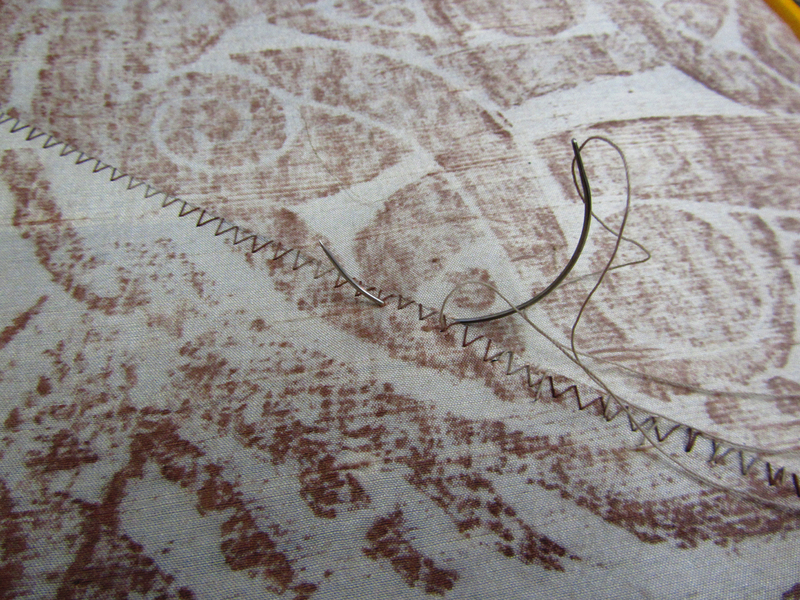 Just to make sure it stayed put, I put a "denim" needle on my stitching machine and stitched around the perimeter ... straight through the mat board. Next, I applied Yes! Paste, a glue generally used by bookbinders, to the back of the mat board and attached it to the black Kraft paper. It stayed under weights for 24 hours. 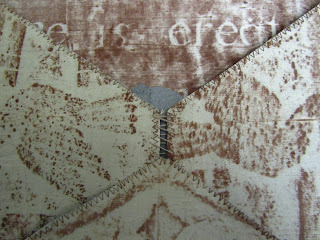 The side flaps and bottom of the envelop were then folded into place. Using a curved needle, also in my book binding supplies, I stitched the bottom to the side flaps. 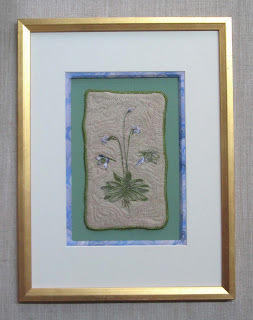 I used buttonhole thread. In order to give a little "breathing room" to the interior, I didn't quite pull the sides together. Perhaps I should have added a bit to the template. Now, I had a small problem ... a "gap". This was one of the problems I'm glad I had ... because the solution became a better design as a result. 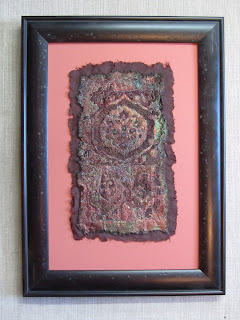 I decided to mimic sealing wax. 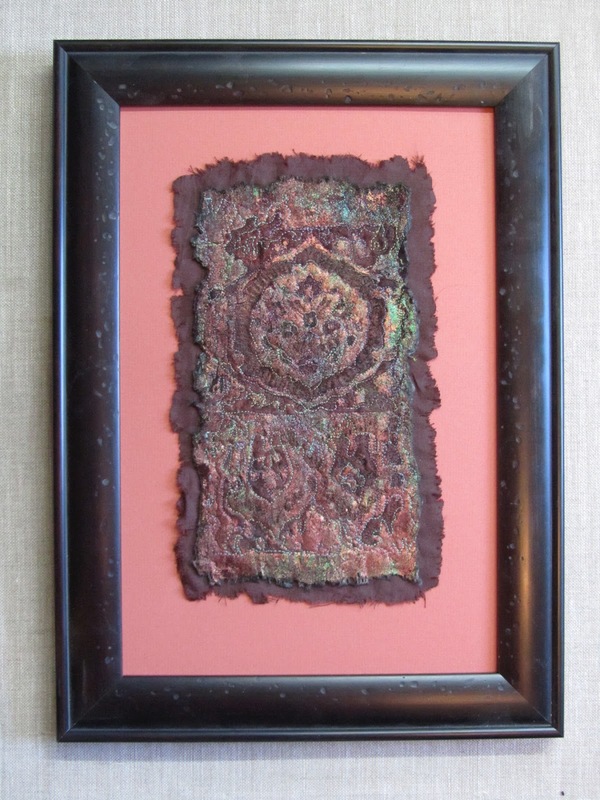 As a kid, I loved melting crayons and candles onto paper and embossing the hot liquid as it solidified. 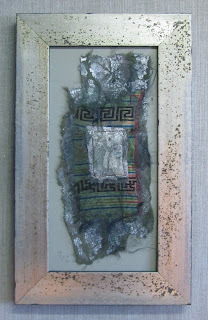 To make this additional piece, I mixed the same Iridescent Stainless Steel Golden acrylic with gloss medium. I poured it over a plastic lid ... twice. The first attempt was sort of "wobbly" (on the right, above). 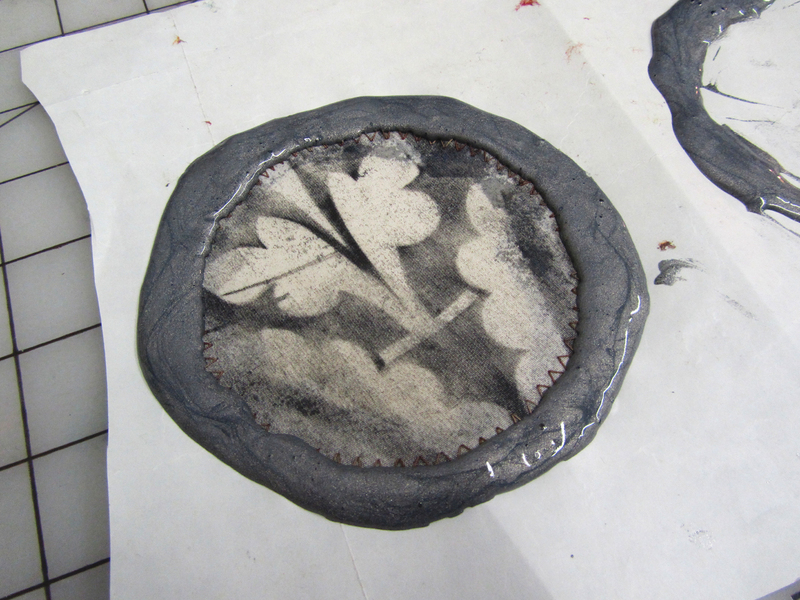 The second attempt is on the left with the lid still under the poured paint. It went much better. 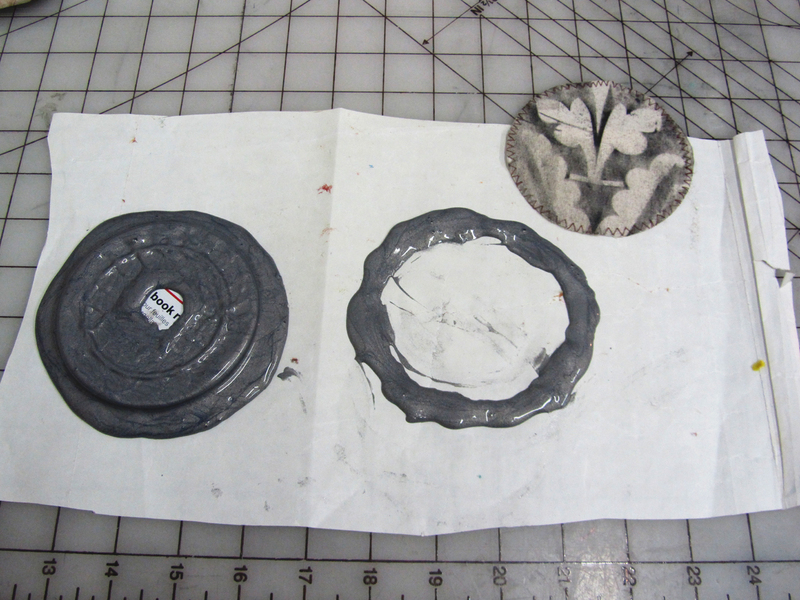 I stuck a hat pin into the plastic lid, lifted it off the silicone treated paper and pressed a previous cut circle from another grave rubbing into the wet paint. This was allowed to dry overnight. 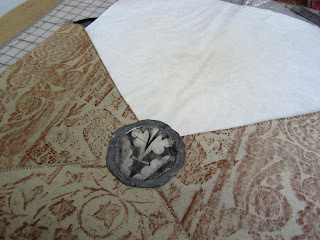 The next day the acrylic was dry and the mock wax seal peeled off the silicone treated paper. It was ready to be glued onto the envelop. I put the silicone paper inside the envelop so as to protect it from any of the glue on the back of the mock wax seal. Yes! glue was used to adhere it. Again, this dried overnight. 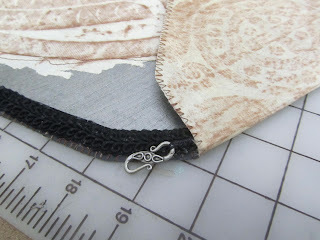 The last thing I did to the envelop was to stitch ornate clasps to the sides. These can be used to hang the work on a wall. (They tuck neatly into the envelop, unseen, when not in use.) 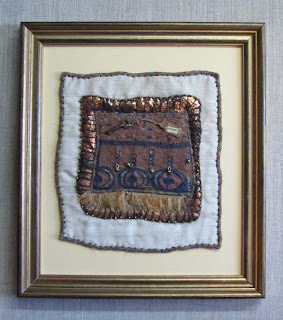 I also stitched a black "hook" (half of a large hook-and-eye) to the top center. This envelop was designed to hang both against a flat wall or "in-the-round", suspended from a ceiling using a thin thread of mono-filament. ... and the back! Yet, this is only part of my vision! 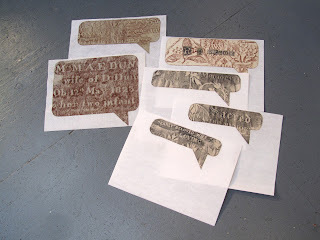 During all the "drying times", I was also working on the "text messages"! Not all telephones display text messages inside of cartoon like clouds, but mine does! 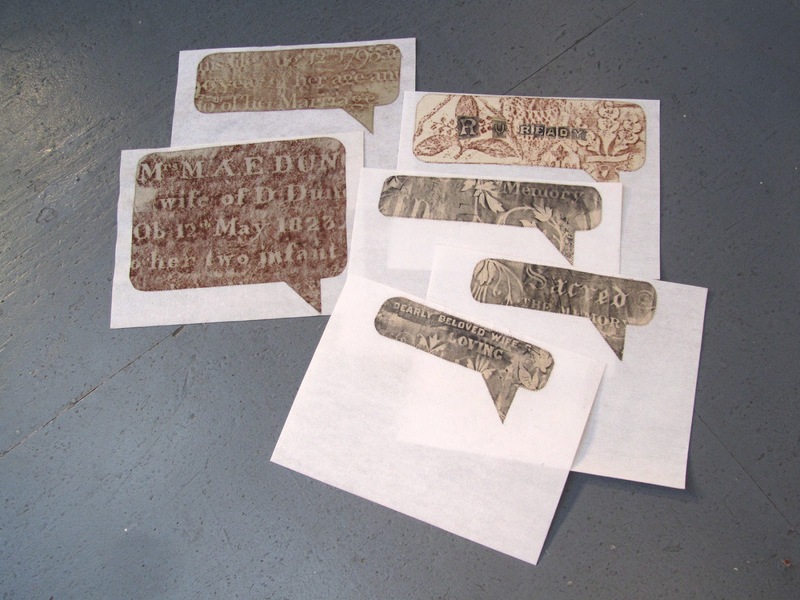 So, in order to make the text messages also reversible, I cut other pieces of grave rubbings in these shapes. They fit comfortably around the words on the reverse side. I zigzag stitched around the perimeter ... which shows on the front. Early this morning I went to Gallery 80808/Vista Studios. My studio is over the wall on the left. 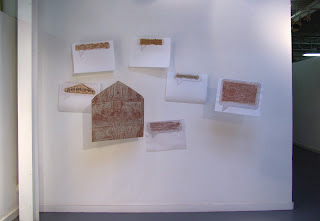 I suspended the envelop and the messages on a wall where my mentor's giant wave painting hung the day before. Wednesday is the day when exhibitions are changed. By tomorrow, the next show will be in this space ... but, this morning, the gallery was all mine for photography. Other than the "in progress" shots, all the images here were taken within two hours. Several more are below. Of course the SAQA call-for-entry will not consider the "installation". So I shot several individual messages inside the envelop for this opportunity. I am still debating which picture to send. I like Be Ye Also Ready but mainly because the opposite side has the more 21st century text: R U Ready. I like this photo too because the text message is short enough to be seen in its entirety along with the whole 18th century angel's face behind it. Perhaps the best single view is this one! Let me know if you have an opinion! 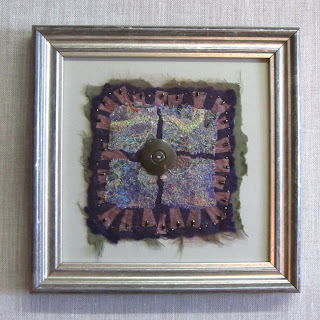 I am attaching this blog post to Nina-Marie's "Off the Wall Fridays", an Internet location for artists working with fibers to share works in progress.